Baird T Spalding » Blog Archive » Hanh Trinh Ve Phuong Dong – A Vietnamese prelude to Spalding’s Life and Teachings? Published by todd on September 15th, 2009 in General. Most of this book is available online, and despite the imperfect translation of Google Translate it is quite fascinating. All of the facts point to this book being a derivative fictional work written by Phong, rather than a translation of Spalding. As visitors to this blog may have guessed, the key item that indicates this is a work of fiction is that my research has established beyond a doubt that Spalding never visited India in 1894 as he claimed in Life and Teaching. I’ll be publishing more on this topic later, including evidence which shows where Spalding spent most of the 1890’s. Logic would suggest that any prelude or sequel to the fictional 1894 visit is also fictional. There are no references to Spalding ever having written a book titled Journey to the East published in India. The four volumes of Life and Teaching were Spalding’s only books published prior to his death in 1953. Life and Teaching volume one was first published in San Francisco in serial form in 1922, then as a book in 1924 by the California Press. The translation of Hanh Trinh Ve Phuong Dong contains no mention of dates on which this journey occurred. As a reasonably detailed timeline exists for Spalding’s life from 1898 onwards, as Jean Luc suggested and the text hints, we must assume that Hanh Trinh Ve Phuong Dong took place prior to the 1894 India mission described in Life and Teaching. Given that Spalding was born in 1872, he would have been barely 21 years old at best. It is unlikely a 21 year old would be a University professor leading a mission to India. Hanh Trinh Ve Phuong Dong states that Spalding was born in 1857 in England, and indicates that the mission to India departed from England. As outlined in previous posts on Spalding’s biography, this was simply a story propagated by Spalding and DeVorss, and not factual. Spalding was born in 1872 in upstate New York, but an author working in 1975 is unlikely to have known this fact, and would have assumed the 1857 date was correct. Hanh Trinh Ve Phuong Dong mentions many universities and professors. There are many similar claims in promotional material surrounding Spalding but these are simply not accurate. Spalding was not a professor or a doctor and according to University registrars there is no record of Spalding studying at Cornell, Stanford or Berkeley. Regardless, granting a 21 year old Spalding the title of Professor is clearly a literary invention. If there had been a mission to India funded by these universities as described in Hanh Trinh Ve Phuong Dong, records of it would still exist today. There are a number of errors and anachronisms in Hanh Trinh Ve Phuong Dong which confirm that it is fictional. The most obvious error is that at least two of the people mentioned in the text either could not have accompanied Spalding on this trip, or were not alive at the time indicated. Paul Brunton, author of A Search in Secret India, is mentioned in the book. Brunton did travel to India, but not with Spalding, and he dismissed Spalding in his notebooks which are widely available today. Most importantly, Brunton was born in 1898, and did not meet Spalding until early 1936 during Spalding’s India tour. Another person that appears repeatedly in Hanh Trinh Ve Phuong Dong is Professor Walter Evans-Wentz, a Stanford professor world famous for his expertise on Buddhism. 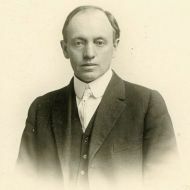 According to his biography, Evans-Wentz was born in 1878 in New Jersey, and completed elementary school in June, 1892. He worked as a journalist before enrolling at Stanford in 1901. The earliest record of Evans-Wentz visiting India is 1910. Evans-Wentz’s papers are available at Oxford, Stanford and there is a published biography (Pilgrim of the clear light, by Ken Winkler). There are no references to Spalding in Evans-Wentz’s biography at Google Books and no record of the claimed trip described in Hanh Trinh Ve Phuong Dong. Finally, Chapter 1 of Hanh Trinh Ve Phuong Dong makes reference to an infamous Time magazine cover proclaiming God is Dead, which was published in April 1966. This would be impossible for a book written in 1924, or indeed any book written by Spalding, who died in 1953. The 1970’s was a time of broad excitement in the New Age and a renewal of interest in Baird T Spalding. Several other mystics claimed a connection with Spalding around this time, and many of their claims have since proven to be inspired more by the desire for publicity rather than accuracy. Since Hanh Trinh Ve Phuong Dong was published in Vietnamese only, it probably flew under the radar of Spalding’s publisher DeVorss & Co. A long article in a Vietnamese online forum gives some background to the book, and claims that Nguyên Phong is the alias of a Boeing software engineer who wrote the book after emigrating from Vietnam to the US. It would be interesting to find out from Nguyên Phong what inspired him to write this book and expand on the Spalding mythos. Readers with more information on Hanh Trinh Ve Phuong Dong are invited to comment below. hanh trinh ve phuong dong has inspired me greatly and opened my mind to the possibilities unknown, unseen, and unproven. regardless of its origin, the book is a treasure trove of esoteric ideas explained scientifically, and logically. it also made references to the christian bible when explaining eastern thoughts, both buddhism and hinduism. not only is the content fascinating, the language used and the style written in made the book a timeless classic full of reverence and respect for the things which we know and those to be discovered. i am fortunate to have been turned on to this book by my little sister (thanks, cc), and wish it would be possible to share it with the english readers. perhaps some day this book will be discovered if it is in fact written by mr. spalding. if not, i sure hope some one will translate it into english, google translate just will not do. lastly, in my numerous readings and listenings, mr. paul brunton was never mentioned in the book. however, (off the top of my head) in the book “a search in secret india”, mr. brunton mentioned the ancient book bhrama chinta and mr. sudei babu similarly to that in “hanh trinh….”. Paul Brunton is mentioned at the end of the first paragraph of Chapter 1, along with “Sir Walter Blake”, allegedly a Englishman published in a scientific journal, and Max Müller. I’m very familiar with Brunton, who was a follower of Ramana Maharshi, because he is on record about Spalding. Of course, Nguyên Phong did not know this (and neither did David Bruton, author of Baird T Spalding As I Knew Him), so they included Brunton’s name as a Spalding supporter when in fact Brunton was just the opposite. Either way, it’s not feasible that Spalding would have quoted Brunton in 1924 – Brunton didn’t write his first book until 1931 and they didn’t meet until 1936. I can’t identify who Sir Walter Blake was, so that is possibly a fictional name created by Nguyên Phong. The third person is likely a reference to Friedrich Max Müller (1823-1900), a German scholar who translated many Indian works. I have no doubt that Hanh Trinh Ve Phuong Dong is a fictional work, however inspired. I do agree that a better translation into English would be ideal. Thanks for bringing it to my attention. i stand corrected, paul brunton indeed was mentioned in chapter 1.
my 1985 copy did not include that portion, but the online version does include a paul bruton (sic). Thank you so much for the information. It is very interesting background, indeed. Regardless of whether the book “Hanh Trinh Ve Phuong Dong” by Nguyen Phong is fiction or non-fiction, it is an excellent book because it provides many valuable lessons to its readers. I was one of these readers and like the Vietnamese version “Hanh Trinh Ve Phuong Dong” very much. After reading your web blog, I went on Amazon web site and searched for “Journey to the East by Baird Spalding”. I found out that Bien Giang and Poven Leace have just released their English tranlation of “Hanh Trinh Ve Phuong Dong” which is “Journey to the East”!!! It is interesting that the “Hanh Trinh Ve Phuong Dong” now has its English translation. A dream comes true!!! Thanks to Thuy Phuong for the information on Journey to the East by Baird T. Spalding. Poven Leace, translator of Hanh Trinh Ve Phuong Dong, has agreed to an interview which I will publish on the blog once complete. I have also contacted the original author Nguyên Phong, but he did not respond. On previewing the English translation on Amazon.com, I found another major error made by Nguyên Phong when he wrote this tale. On p126, the author and ‘Vishudha’ state that grapes cannot grow in India because it is a tropical country, and the scientists are amazed when Vishudha produces a bunch of fresh ‘Pajouti’ grapes, allegedly grown only in Italy. According to the article below, grape cultivation was introduced into India in the 1300’s and grape species have been grown for centuries. India currently produces over a million ton of grapes every year, and has done so for many years, even in the 1890’s when Hanh Trinh Ve Phuong Dong is supposedly set. The commercial products of India, being an abridgement of “The dictionary of the economic products of India.” Sir George Watt, Publisher: London, J. Murray, 1908. The full text of the Watt’s books (all 1200 pages) is available at http://books.google.com/books?id=8C0aAAAAYAAJ and it has extensive discussion of grape crops in India at the turn of the century. Grapes also grow in Vietnam, so it’s not clear why Nguyên Phong thought they didn’t grow in India and included it in his book. thank you, thuy phuong, for the info on the english translation. that is very good news. if mr nguyen phong wrote the story himself, he would amaze me even more. he must have been in his 20’s or early 30’s in 1975 when he began to publish the book in monthly series, he obviously was a person who knew and understood a lot of things. he was spiritual for sure. english readers are now in for a treat. “life and teachings” readers now have a proper introduction. i am so happy, and looking forward to reading the new translation. i noticed from amazon.com that this title was available since sept. 17th, about 3 weeks ago. i am also looking forward to reading todd’s interview with poven leace. ciao! It’s quite dissappointed to know HanhTrinhVePhuongDong is only a fiction. NguyenPhong should have stated that it was a fiction instead of claiming it was a translation. Truth is not served by such claims. And Spalding too, if “Life and Teaching” was a record of his “astral body” journey, why didnt he say so? You should not be disappointed when you learn from this blog that HanhTrinhVePhuongDong is a fiction. If you like what were written in the book, you should feel good and embrace what you absorb. If you believe in the contents and find that the contents help comfort you, it is already more than what you can ask for. This is a true blessing for you! Many of us have different opinions about everything. What you appreciate may not be the same with what people value. On the other hand, what people do not like may be what you are fond of very much. Some people who read HanhTrinhVePhuongDong suggested that it is a friction. However, other people proposed that it is not a friction. The bottom line is that these are merely propositions. Why is it so important if it is friction, or why is it so important if it is non-friction? To the best of my knowledge, NguyenPhong does not respond anything to anyone. He also does not make any comments about HanhTrinhVePhuongDong since he published it in 1987. Since Baird Spalding passed away in 1953, he definitely did not confirm anything to anyone. Hence, everything you learn from this blog is subjected to probing questions. I read HanhTrinhVePhuongDong, and I think highly of philosophies in this book. I apply these philosophies to my life, and I feel peaceful and wonderful. My life has changed drastically for the better since I read HanhTrinhVePhuongDong. I do not trash my wisdom and throw my happiness away just because of what people say or how people think. No one is right or wrong in this world because everything is comparative. I hope that you trust your own judgment and be happy with what you learn and who you are. Nguyenphong has never provided any information on whether HanhTrinhVePhuongDong is a fiction or a non-fiction. It is up to you to decide whether it is a friction or it is not… With your high level of human evolution, I am sure that you can justify the nature of the book by yourself. Please trust your own judgment before believing or listening to anyone else. If the contents of the book support you and give you positive influence in life, that is all you need…. Thank you very much Lilianie and Andrea for your thoughts. Yes, though “fiction or not fiction” is still the question [at least for a researcher’s mind], I absolutely agree with you two that the book’s insights are so rich, valuable, universal and timeless. I’ve been wondering where Spalding and NguyenPhong found such insights and knowledge from. If they are “vehicles” for wisdom to express itself, then the vehicles are brilliant. fiction or not fiction ? untill I met a guy called Daniel Pomerleau who was able to produce a lot of electicity from nothing like told in the french version of this book from Spalding. Thomas, there are a couple of interesting connections between Spalding and fringe science/perpetual motion cases like Pomerlau. Paul Baumann, founder of the Swiss Methernitha commune (http://en.wikipedia.org/wiki/Methernitha) and inventor of the Testatika free energy machine was inspired by Baird Spalding while in prison during the 1970’s. i read this book in the original Vietnamese many years ago and always suspected it was fiction. the writing style is very different to Spalding (even allowing for translation) and what you have written above confirms that the details have been made up. one item you overlooked caught my attention at the time. in the life and teachings, Spalding says the names of the researchers must remain confidential, but then in Hanh Trinh Ve Phuong Dong there are many famous names and universities which appear nowhere else in his books. personally i suspect much of what Nguyên Phong wrote comes from the other Spalding books and other spiritual works of the time, with some personal imagination added. perhaps Nguyên Phong put the reference to the 1966 time magazine cover as an inside joke to people who were willing to read between the lines and see this was just a story? you may be interested to know that during the 1970’s in vietnam there were no books imported from the west, and many strange and creative books like this appeared in local printings. also, in vietnam at that time it would have been very hard to research the history of the researchers Nguyên Phong wrote about, which explains why the dates don’t match up. Nguyên Phong’s name was also on the Lobsang Rampa books which made very similar claims to Spalding. i discovered to my amusement many years later that Lobsang Rampa was the pen name of an English plumber who had never been to Tibet! I didn’t pick up that contradiction between Life and Teaching and Journey to the East in terms of naming the researchers. Good point. Spalding stresses that they will remain anonymous in the intro to several volumes, which runs directly counter to Phong’s book that includes many names. The fact that Life and Teaching omitted names and dates in general has helped it to withstand casual scrutiny, unlike Journey to the East which can quickly be shown as fictional by researching the other people involved. Just this evening I found a 1974 Vietnamese translation of Life and Teaching Vol 1 titled Á Châu Huyền Bí (Mysterious Asia), credited incorrectly to ‘Dr Blair T Spalding’. It seems Spalding was quite popular in Vietnam during the 70’s. Thanks for posting this. I was pretty annoyed that this book is passed off as written by Spalding when it is not. The terrible writing style was my first clue. I think the translators are just trying to cash in on the demand for Spalding books. Thanks for this website, where I can find many useful fact (?). I would like to know the percentage in common between the original series of Spalding and HTVPD of Nguyen Phong. This is very helpful for me since I used to inspired with HTVPD and now got a lot of surprise and disappointment. I have not done a detailed analysis. There are many similar themes and concepts in HTVPD to Spalding but is basically an original work of fiction. Certainly all of the names of scientists etc that appear in HTVPD are original because Spalding generally didn’t name his associates. Poven Leace translated Hanh Trinh Ve Phuong Dong into English to share the thoughtful and helpful contents with those who can neither read nor understand Vietnamese. From the English translation I have, Poven absolutely has no intention to translate the book for cashing in on the demand for Spalding’s books as JJ wrote. To all of us who read this web site, why can’t we just embrace the meaningful contents of the book and try to be the best persons as we can be? Why do we have to criticize other people and find fault in everything? How can we be good people if all we see in other people are bad? Our own ego and arrogance are our enemies! I completely agree with you. You have a wonderful philosophy of living. That’s the way, we should not always try to criticize people and find fault in everything. We should concentrate on what is essential and ignore the superficial appearance. How wonderful to find happiness in generosity and forgiveness. I like Journey to the East because it teaches us how to forget our ego and to be humble. It reminds people of the univeral law of causality and effect: As Ye Sow, So Shall Ye Reap! It also teaches us that there are lots of things that money cannot buy, especially when it is concerned with HAPPINESS. If everybody thinks the way you do, our world will certainly be a better place to live! Let’s pray for that! the product description of lotus on the snow says that “…The lessons drawn from this book are valuable accumulations of personal experience that neither power nor money nor fame can buy…” you will probably find a lot of things that money cannot buy in another book of nguyen phong. i like your answer to open-highmindedness. hope to hear from you again. why do not you trust your own instinct instead of listen to the mean-minded people from this web site? they are so jealous with nguyen phong, so they put words in his mouth. It doesn’t surprise me that there is *another* book by Nguyen Phong in which the mysterious English original cannot be found like HTVPD. Out of interest I searched Google Books and Alibris for “The Mani Stones”, supposedly written by Alan Havey and published by Dharamsala Press in 1990. I can’t find a single mention of this book, the author or even Dharamsala Press anywhere. Yet a copy managed to make its way to Nguyen Phong for him to translate and publish his version “Lotus On the Snow”? i agree with you. if mr nguyen phong wrote hanh trinh ve phuong dong himself, i would admire him even more. for a 25 year-old young man to write “hanh trinh ve phuong dong” and “trong long dien tu” concomitantly and publish them in monthly series in 1975 at a refugee camp, he must be an exceptionally rare individual. jeanluc, your characters are indeed revealed by how you see nguyen phong!!! instead of trying to learn valuable lessons and appreciate precious experiences in journey to the east and lotus on the snow, JJ is trying to find the original books. i feel very sorry for him because it is like he goes to a famous restaurant, orders the best dish, and pays the most expensive price, but he has no time to enjoy the food because he is way too busy to look at the napkin, the silverware, and the plate. also, instead of paying attention to moral messages in hanh trinh ve phuong dong, JJ concentrated on criticizing the style of writing of nguyen phong and accusing poven leace of cashing on the demand for spalding’ books. I feel bad for JJ because he unintentionally discloses his own characters and does not even realize it. as humble and noble as nguyen phong is, he always remains to be a real role model for people who have high levels of human evolution. for those who highly criticize nguyen phong, all they do is to deposit the best-quality seeds of jealousy, mean-mindedness, resentment, and hatred into their own conscious land. if JJ could realize and learn only about 10 % of what nguyen phong intended to disseminate, he would be a young deity himself. I should point out that the posts by Pham, Tran, Ted, Lilanie, Andrea, Open-Mindedness, Polmalia, Remigio and FF all came from the same IP address in New Mexico, indicating they were most likely made by the same individual. If you are going to comment, please use one name and stick to it. The truth is always hurt, but it is good. If we do not experience this kinds of hurtful feeling ourselves, we will not stop criticizing other people. Commonly , if we are talented and intelligent, we are not jealous of others. on “Lobsang Rampa”; nor have said anything about Spalding having “added two further volumes”. that the bracketed comment is NOT in the original quoted material, but rather an editorial comment. Roger – Thanks for the comment but you are incorrect. The entire quote I posted (clearly marked) is from Brunton’s published notebooks, and is not modified. Obviously it was written by Brunton at some later point since Lobsang Rampa didn’t show up til the 1970s. To whom who say “let’s forget about the origin of the book, let not finding “fault” ,just enjoy the philosophy! !” – Based on what I read here, what’s about the TRUTH? if you can’t and won’t reply to inquiries about the source of your translation, then there is a question mark and it will be there forever – I suspect that this book is selling well in Vietnamese just because it is attributed to an English writer (it’s the Vietnames thing, you know _ I am a vietnamese myself,so I know) – now is is “retranslated into English”, how weird is that? and for what purpose? ==> to sell it to a wider audience this time using Spalding’s name – How sucessful it’ll be only time will tell. Overall, I think it’s deplorable if this is what it is! The books Hanh Trinh Ve Phuong Dong and Hoa Sen Tren Tuyet (Lotus on the Snow) in Vietnamese are both for free as audio-books. You can download them from many websites. I am now reading the English version of Nguyen Phong’s Hoa Troi Tren Song Nuoc (Journey in Search of the Way, Satomi Myodo) to compare. This book in Vietnamese is also for free, unlike the English version. So please reconsider this statement from your comment: “I suspect that this book is selling well in Vietnamese just because it is attributed to an English writer (it’s the Vietnames thing, you know _ I am a vietnamese myself,so I know)”. Thank you Todd for doing research on this. Reading all the posts on this topic answered many of my questions, including the ones concerning Nguyen Phong’s background. When I read the book HTVPD, I thought it was about facts, about an actual journey to India with meeting with the Masters… It was so interesting. It provoke my thoughts about this world based on inspiring supernatural phenomenons described in the book. When I found out it was just a fictional work. I was so disappointed. I was cheated. Thank you very much, Todd, for providing us with the truth. Tôi là một phật tử. Khi có được quyển sách, tôi vô cùng thích thú và đọc một hơi từ đầu đến cuối. Tôi vô cùng hân hoan vì đã tìm thấy kim chỉ nam cho đời sống tâm linh của mình. Tôi thấy những tư tưởng của Đông phương sao mà minh triết và vi diệu quá. Tôi đã tâm nguyện là sẽ dành thời gian rảnh để nghiên cứu sâu thêm triết học và khoa học huyền bí của Ấn Độ. Tuy nhiên tôi bị lựng khựng vào gần cuối sách, ở Kỳ 9: Cõi vô hình, chỗ Hamud nói về sự trở lại của các pháp sư cổ đại Ai Cập ở đoạn gần cuối. Các bạn hãy đọc kỹ những dòng này: “Chuyện xảy ra đã bắt đầu xảy ra, theo thời gian các ông sẽ thấy. Dù các pháp sư tà đạo thời cổ này có khéo léo dẫn dụ con người bằng những danh từ hoa mỹ, những chủ thuyết đẹp đẽ thế mấy đi nữa, thì họ vẫn chỉ có thể sống như một con người. Dù thế nào họ cũng không thể bỏ qua các thói quen cũ của quá khứ, họ sẽ đội lốt tôn giáo, họ sẽ kêu gọi sự hợp tác của thần quyền, họ sẽ đặt ra các giáo điều mới, thay thế các chân lý cao đẹp để lôi kéo con người từ bỏ Thượng đế. Họ sẽ sử dụng danh từ, ngôn ngữ để đánh lạc hướng mọi người, tuy nhiên trước sau gì họ cũng phải chết và trước khi chết, họ sẽ di chúc yêu cầu ướp xác họ và xây dựng những nhà mồ vĩ đại bằng đá như họ đã từng làm trong quá khứ…” Sự ám chỉ rất rõ ràng, các pháp sư Ai Cập cổ đại quay lại thế kỷ 20 (bối cảnh của câu chuyện là cuối thế kỷ 19) với hình hài của các lãnh tụ cộng sản. Một sự ám chỉ đậm màu sắc chính trị! Cho tới khi bị khựng lại tôi vẫn tin cuốn sách này do Nguyên Phong dịch từ một tác phẩm hồi ký có thật, qua những lời nói đầu, lời giới thiệu “như thật” không biết của dịch giả hay nhà xuất bản: “…Hồi ký của giáo sư Spalding là một công trình nghiên cứu nghiêm túc với nhiều dữ kiện được đoàn ghi nhận đầy đủ một cách khoa học, và cho đến nay vẫn còn nhiều độc giả hâm mộ, nhiệt liệt tán thưởng các quyển hồi ký này”. Khi bắt đầu hoài nghi, tôi đi sục sạo tìm đọc nguyên bản tiếng Anh, rồi vào được trang này. Thật là thất vọng không sao kể xiết. Sự mập mờ, nguỵ tạo của NP, theo tôi đó là sự đánh giá thấp, coi thường độc giả. Tôi mất lòng tin ở NP quá. Sau đó tôi có đọc bài “Thông điệp từ những người anh”, minh triết không kém gì HTVPĐ, đọc xong thấy ghi dịch giả NP thấy nghi nghi hoặc hoặc, nhưng chẳng buồn đi kiểm tra độ xác thực nữa. 2. Công bằng mà nói, đây là một sáng tác rất hấp dẫn của NP, nhưng những chi tiết mang màu sắc chính trị ở cuối Kỳ 9 của sách tôi nêu ở trên là những gia vị tồi làm hỏng bét món ăn ngon. NP không thể núp bóng triết học và tư tưởng Ấn Độ để bôi bác cộng sản như thế. Nếu muốn bày tỏ chính kiến của mình, NP có thiếu gì phương cách quang minh chính đại hơn nhiều (xin nói rõ tôi không phải là communist, tôi chỉ cảm thấy vô cùng khó chịu khi đang đọc sách về tâm linh và tư tưởng bỗng bất ngờ thấy thòi ra một cái trò mèo chính trị). Rất buồn cười là sau khi đọc HTVPĐ, tôi mới thấy là bộ máy kiểm duyệt của Việt Nam đôi khi cũng mắc sai lầm. Mới đây thôi, Tuổi Trẻ, một cơ quan ngôn luận chính thống và rất nghiêm túc của VN, với đội ngũ biên tập chuyên nghiệp, cũng mắt nhắm mắt mở cho đăng HTVPĐ trên bản Tuổi Trẻ Mobile của mình. Họ cũng đăng những lời giới thiệu “như thật”, chẳng buồn kiểm chứng độ tin cậy của tài liệu, cũng chẳng để ý gì đến chỗ chửi xỏ của NP. Tổng biên tập Tuổi Trẻ mất chức như chơi, nếu chẳng may Comment này lọt vào mắt xanh của lãnh đạo cấp trên nào đó. Upon knowing that Nguyen Phong isn’t the translator, I was deeply disappointed and still am. It isn’t hard for anyone who have read the first few chapters of “A Search in Secret India” by Paul Brunton to notice the amazing similarities between this book and the one by Nguyen Phong. Can I call the man a damn plagiarizer? Deeply disappointed. I have also read this book. And Im also fascinated indeedly. I search and know this site. Deeply disappointed same as everyone. Thank Todd. If you do not believe what’s in this book, you can read this book ‘The Astral Plane’ of https://en.wikipedia.org/wiki/Charles_Webster_Leadbeater . Todd what and how you think about this book. Hope this will be used to every one. Thanks for this site and posts! Due to haven’t read HTVPD, so I don’t have any comment on it. But I want to say some words about an another Nguyên Phong’s book-Dấu chân trên cát (footprints left on the sand-DCTC), which is a prequel from a novel by Mika Waltari, whom Todd mentioned above. This Nguyen Phong’s book is only in Vietnamese language and the main readers are Vietnamese, so let’s me write my comment here in Vietnamese. DCTC đã được xuất bản cả ở Việt Nam và nước ngoài, cả dưới dạng sách in lẫn sách nói. Phần lớn đều ghi Nguyên Phong phóng tác từ “The Egyptian” của Mika Waltari, trừ sách do NXB Hồng Đức xuất bản năm 2016 ghi “dịch giả Nguyên Phong” (https://www.sachkhaitam.com/tu-sach-1/nguyen-phong/dau-chan-tren-cat). “The Egyptian” là bản tiếng Anh của Naomi Walford, dịch từ tiểu thuyết bằng tiếng Phần Lan “Sinuhe-Egyptiläinen” của Mika Waltari. Song trong DCTC, Nguyên Phong không đưa tên dịch giả tiếng Anh. Điều đáng nói hơn là trong lời nói đầu của DCTC, Nguyên Phong giới thiệu về tác giả Mika Waltari một cách hết sức sơ lược và không chính xác. Nguyên Phong viết rất sai rằng: “Mika Waltari (1908-1979) là một nhà soạn kịch nổi tiếng, đã viết hơn tám mươi kịch bản cho sân khấu kịch nghệ Broadway.” Và “Cho đến nay, dù đã soạn hơn tám mươi vở kịch nổi tiếng nhưng The Egyptian vẫn là cuốn tiểu thuyết đầu tay và duy nhất của ông” Trong khi đó Mika Waltari là một trong số những nhà văn nổi tiếng nhất trên thế giới của Phần Lan, đã sáng tác rất nhiều thể loại khác nhau từ tiểu thuyết (22 tác phẩm), truyện vừa (15), kịch (26 vở), thơ (6 tập), truyện ngắn (4 tuyển tập), đến truyện trinh thám (7 tập)! Về sự ra đời của “The Egyptian” Nguyên Phong viết như thật: “Trong chuyến du lịch Hy Lạp, ông nghe kể về Sinuhe, một giai thoại phổ thông vẫn được lưu truyền trong dân gian xứ này. Ông đã tìm hiểu, tiếp xúc với các bô lão để ghi chép, thâu tập chi tiết về nhân vật lạ lùng này rồi thêm vào đó một vài tình tiết với ý định sẽ dựng một vở kịch lớn nhưng nửa chừng, ông bỏ ý định và soạn thành cuốn tiểu thuyết “The Egyptian”. Trong khi trên thực tế Mika Waltari viết “Sinuhe-Egyptiläinen” khi chưa hề đến Hy Lạp hay Ai Cập. Ông chỉ dựa vào những tư liệu sưu tầm được trong tủ sách của gia đình và từ các thư viện ở Phần Lan. Khi được biết Nguyên Phong là bút danh của một nhà khoa học rất nổi tiếng, tôi không thể hiểu được vì sao ông lại làm việc một cách dễ dãi (thiếu khoa học) như vậy với DCTC? Phải chăng ông nghĩ văn chương không cần sự chính xác với những vấn đề như vậy? Khi được biết Nguyên Phong là bút danh của một nhà khoa học rất nổi tiếng, tôi không thể hiểu được vì sao ông lại làm việc một cách dễ dãi (thiếu khoa học) như vậy với văn chương? Phải chăng ông nghĩ văn chương không cần sự chính xác với những vấn đề như vậy? Khi được biết về “sự bí ẩn” của bản gôc cuốn “Hành trình về phương đông” tôi lại càng thấy khó hiểu hơn về việc làm của ông. Nguyen Phong(NP) real name is Vu van Du and a Boeing engineer working on armament/military side of Boeing. I suspect he is retired by now but years ago I came across his CV and he clearly said he worked on the original cruise missile system with many patents on the subject. I happen to know his family very well. I went to college with the 3rd son from a family of 5 sons and NP’s dad and my dad were both pharmacists from the first pharmacy class in Vietnam in the 50s before we lost the war. At the time it seemed incongruous to me that a spiritual oriented person like him would contribute to any type of weapon system and it still does today.